Promotion includes pink FISHER XV2 v-plows and pink lift arm kits. Fisher Engineering will donate $100 for each plow, $50 for each lift arm sold. One pink FISHER XV2 v-plow and one pink SnowEx V-Maxx G2 VX-1500 spreader was raffled off at the 2017 GIE+EXPO, in Louisville, Ky.
During the month of October, Fisher Engineering is running a special promotion featuring limited-edition pink FISHER XV2 v-plows and pink lift arm kits. 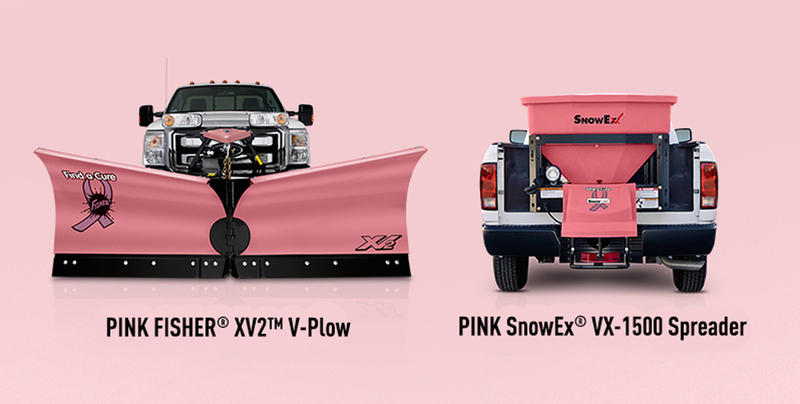 Fisher Engineering will donate $100 from the sale of each pink XV2 v-plow and $50 from the sale of each pink lift arm kit to the Maine Breast Cancer Coalition, where purchasers can choose to make the donation in memory of a person that has been affected by breast cancer. In addition, attendees of the 2017 GIE+EXPO, October 18-20, in Louisville, Ky., can purchase raffle tickets for a chance to win a limited-edition pink FISHER XV2 v-plow or limited-edition pink SnowEx V-Maxx G2 VX-1500 spreader. Tickets for the raffle can be purchased for $10 at the Komen Booth located near the food court. Attendees who purchase two tickets will receive a free FIND A CURE knit cap while supplies last. All proceeds from the raffle will be donated to the Kentucky Affiliate of Susan G. Komen. For additional information on FISHER snowplows, visit www.fisherplows.com. For more information on SnowEx spreaders, visit snowexproducts.com. GIE+EXPO is one of the USA’S largest industry trade shows for landscapers, light construction companies, manufacturers of light- and heavy-duty equipment, and suppliers of gardening and outdoor leisure equipment. GIE+EXPO features indoor exhibits and an outdoor exhibition area. A showcase area for new products allows companies to demonstrate new innovations in their respective markets. For more information, visit www.gie-expo.com. Fisher Engineering and SnowEx are proud to be a part of Douglas Dynamics, North America’s premier manufacturer of vehicle attachments and equipment and home to the most trusted brands in the industry. For more than 70 years, the company has been innovating products that not only enable people to perform their jobs more efficiently and effectively, but also enable businesses to increase profitability. For more information, visit www.fisherplows.com and www.snowexproducts.com.